The four-day course in Rock slope engineering is being held at the Le Meridian Hotel, New Delhi from 24t to 27th October 2018. It will cover a wide range of slope instabilities along with the fundamentals of rock mechanics. As a knowledge partner, we have associated ourselves with this course to share our expertise and advanced technical knowhow in slope engineering. Dr. Manoj Verman, is President of the International Commission on Hard Rock Excavation and a professional in the field of Rock Engineering and Tunneling. He has more than three decades worth of expertise. 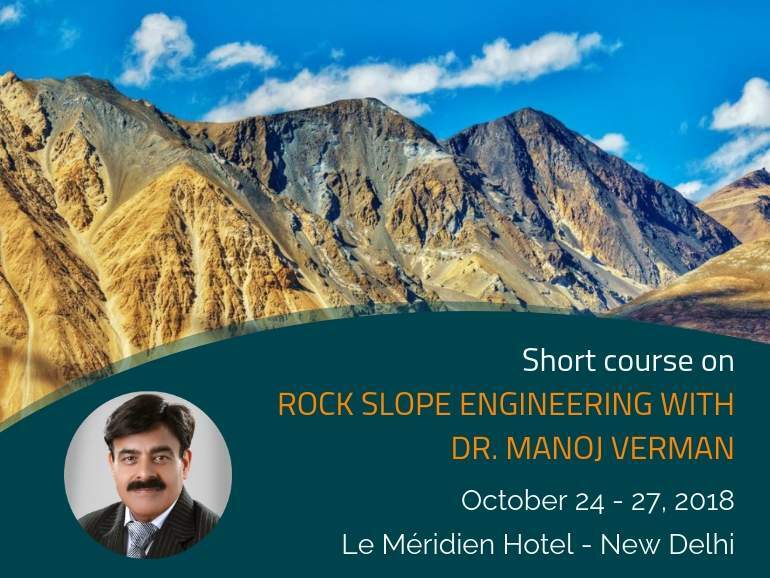 Dr. Verman regularly organizes comprehensive short courses to deliver in-depth understanding of various rock instabilities, structural geology, as well as key points of Rock engineering and slope design. With his Ph.D in Rock Mechanics, Dr Verman is widely acknowledged as an international delegate and is invited to lecture in many parts of India and overseas. We are glad to be an integral part of this program, which enables us to interact and connect with experts from the industry and students to discuss our technical proficiency in the Rockfall and Slope Stabilization sectors where we apply advanced eco-friendly and effective solutions. For more information see the course program or contact us.